The potential source rock portion of the Utica Shale is extensive. In the United States it underlies portions of Kentucky, Maryland, New York, Ohio, Pennsylvania, Tennessee, West Virginia and Virginia. It is also present beneath parts of Lake Ontario, Lake Erie and part of Ontario, Canada. This geographic extent of potential Utica Shale source rock is shown on the map labeled as Figure 1 in the right column of this page. If the Utica is commercial throughout this extent it will be geographically larger than any natural gas field known today. Most of the major rock units in the Appalachian Basin are thickest in the east and thin towards the west. The rock units that occur between the Marcellus Shale and the Utica Shale follow this trend. In central Pennsylvania, the Utica can be up to 7000 feet below the Marcellus Shale but that depth difference decreases to the west. 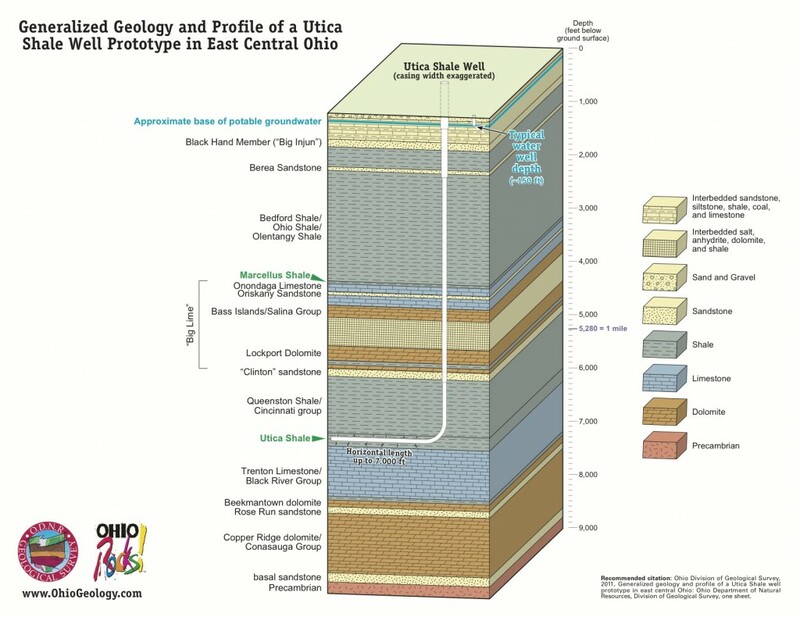 In eastern Ohio the Utica can be less than 3000 feet below the Marcellus.